Communication infrastructures are frequently visualized as flow diagrams that are designed to approximate the spatial relations of a network. As a result, there is a tendency to overlook the uniqueness of particular nodes in a network, whether their physical form, the stories of their development, or the practices which surround them once they are activated. The antenna tree, I want to suggest, represents the potential to develop a more node-centric and materialist approach to the study of infrastructure. 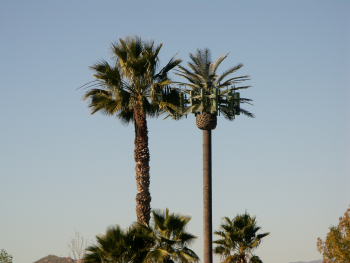 As a cell tower disguised as a tree, the antenna tree draws attention to the materiality of infrastructure in the very process of trying to conceal it. People often chuckle at the sight of these uncanny objects that have been designed to soften the severity of the steel tower with botanical plastics. This tower in disguise not only relays signals, but it is implicated in an array of industrial, legal and socio-cultural relations. 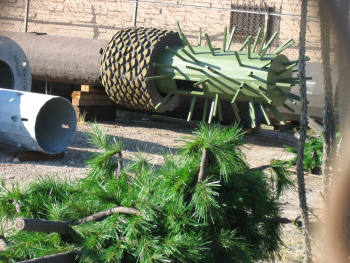 Each antenna tree can be understood as a symptom of processes of fabrication and installation, state and local regulation, community deliberation, and spatial transformation. Thinking around the antenna tree, then, involves considering the fields of negotiation that are produced as an effect of infrastructure development and placement. In this column, I explore what is at stake in hiding infrastructure and how such practices may end up trading technological awareness for a highly synthetic version of “nature.” By disguising infrastructure as part of the natural environment, concealment strategies keep citizens naive and uninformed about the network technologies they subsidize and use each day. We describe ourselves as a “networked society” and yet most members of the public know very little about the infrastructures that support such a designation – whether broadcasting, web or wireless systems. This issue of infrastructure literacy becomes more prescient as we enter an era of ubiquitous computing in which many different kinds of objects and surfaces will be used either as relay towers and/or web interfaces. 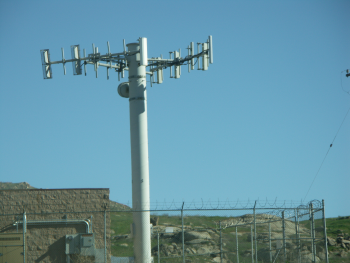 Cell tower concealment began in the US during the early 1990s as wireless carriers installed new infrastructure in cities across the country. These coverings or concealment strategies, as they came to be known, were marketed as a way of disguising unsightly towers that were installed in the midst of urban and suburban areas. As cell towers sprouted up, citizens groups nicknamed NIMBY’s (not in my backyard) formed in communities across the country to protest tower installation especially in residential districts. Such groups expressed concern not only about neighborhood aesthetics, but were worried about potential health risks since the federal government authorized tower installation without conducting trials to assess their effects on people living in their vicinity. Others feared that cell tower installation near their homes would reduce property values. By 2005 there were at least 500 formal complaints filed in communities across the US protesting cell tower installations. Some communities (such as Redmond, Washington) passed ordinances mandating the concealment of towers installed in residential districts and Connecticut created a Siting Council to regulate cell tower placement throughout the state. The opposition to cell tower placement was not limited to residential areas. One of the most controversial installations occurred in Yellowstone National Park. In 2001 Western Wireless Corporation mounted a 100-foot cell tower in close proximity to the beloved geyser Old Faithful. After the installation, it was impossible to look at the geyser without seeing the steel cell tower looming in the distance. In 2004 the environmental organization PEER (Public Employees for Environmental Responsibility) filed a petition trying to have the tower near Old Faithful removed stating that it was illegally installed and done without public comment.1 When Congress passed the 1996 Telecommunications Act it authorized the construction of cell towers on federal lands. Cell tower installations have occurred in other national parks as well, and wireless corporations provide funds to the National Park Service by leasing these lands. For instance, Western Wireless pays $12,200 to the National Park Service each year to lease the land on which the tower near Old Faithful sites.2 A side effect of the 1996 Telecom Act is that private wireless carriers now provide operating revenue to the National Park Service. The installation of cell towers raises fundamental questions about the control of property, whether on the ground or in the spectrum, in neighborhoods or national parks. The cell tower only gained public attention when installed in the “wrong place”—that is, when it was perceived as violating the sanctity of a nationally protected forest or a valued neighborhood. Such controversies are useful in that they draw public attention to infrastructure sites and their relation to social, economic and environmental issues. Wireless infrastructure is defined not only as the capacity, as advertisers would have it, to speak on a phone “anytime anywhere”; it involves the (re)allocation of publicly-owned natural resources, the installation of new equipment on private and public properties, and the restructuring of lifestyles and communities. Given the controversies that emerged around cell tower installation, manufacturers and wireless carriers resorted to the use of camouflages as a way to appease NIMBY and environmentalist groups. 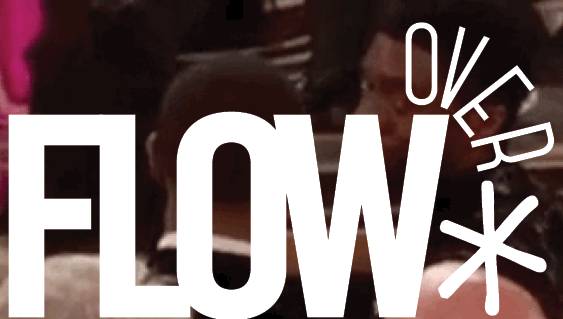 Increasingly, owners have concealed the technology in an effort to mitigate complaints. 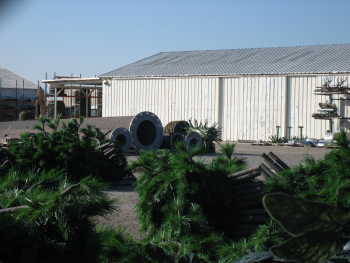 Larson Camouflage based in Tucson, Arizona devised the first “tree tower” in 1992. 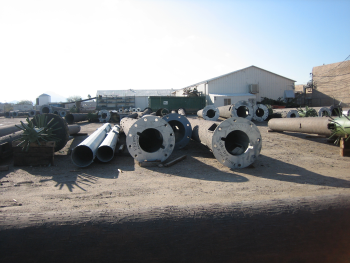 Since then other companies with names such as Steel in the Air, SpectraSite, Clearshot, Crown Castle, Treescapes, TeleStructures, and Pinnacle Towers formed and have sold and installed so-called “stealth towers” designed to look like different tree species, flagpoles, church steeples, mosque minarets, crosses, and grain silos among other things. One company customized a tower to look like an osprey nest. Another sells a “lightning tree” designed to look like a stump struck by lightning. These tower get-ups can cost up to $200,000, and securing permission for their installment can require elaborate planning and meetings with property owners, community groups, local political officials and representatives of wireless corporations. With the globalization of wireless telephony, similar firms have emerged in different parts of the world that specialize in the international distribution of tree tower coverings. For instance, Envirocom, based in Gauteng, South Africa, sells antenna trees to clients in Uruguay, Brazil, the US, Portugal, France, the UK, Holland and Turkey. And the Turkish company Preserved Palm, based in Ankara, has signed deals with clients in Dubai, Saudi Arabia, Qatar, Egypt, United Arab Emirates, Moldova, Kazakhstan and Germany among others. A global industry has formed to conceal wireless infrastructure and these new products have been installed in different sites for different reasons. Given this growing trend, we might ask what is at stake in this concealment? When technologies remain hidden or obscure they remain beyond public concern. Only when cell towers became visible in neighborhoods and national parks did citizens take an interest in them and their effects. Most people notice infrastructures only when they are put in the wrong place or break down. This means that public knowledge of them is largely limited to their misplacement or malfunction. While concealing infrastructure sites may be a viable aspect of urban planning (as has long been the case of sewer, electricity and water systems), one of its effects is to keep citizen/users naive about the systems that surround them and that they subsidize and use. Because of this, it is important to devise other ways of visualizing and developing literacy about infrastructures and the relations that take shape through and around them. Are there ways of representing cell towers that will encourage citizens to participate in sustained discussions and decisions about network ownership, development, and access? What is it about infrastructure that is aesthetically unappealing? What form should infrastructure sites assume? Should they be visible or invisible? While manufacturers and carriers have devised ways to conceal cell towers, some artists have created works designed to draw our attention back to them. German photographer Robert Voit has exhibited a series of photographs entitled “Enchanted Wood” that were taken between 2003 and 2005 in the US, Great Britain, South Africa, Korea, Italy and Portugal. The photos draw upon the conventions of landscape photography and scientific illustration to present an inventory of cell towers that have been camouflaged as different tree species in different settings. Each photograph represents an antenna tree in isolation, whether cactus, pine, palm or cypress, as well as the environment surrounding the tower whether a desert floor, grassy field, parking lot, or mobile home park.3 The photos work to expose an infrastructure site that has been carefully designed to blend in with the environment, while also subtly alluding to the imperceptible signal transactions that traverse geophysical and electromagnetic territories. The politics of infrastructural invisibility that take shape around the antenna tree involve citizens’ concerns about neighborhood aesthetics, health and property values, environmentalists’ protection of national parks, global corporate enterprises, and artists who challenge us to reflect upon the contexts and effects of infrastructure concealment. Though these groups are situated around the antenna tree in different ways, they all draw attention to and help to generate dialogues about it. Perhaps the ultimate irony of the antenna tree is that it actually exposes more than it hides and in this sense can be thought of as a site for generating further public knowledge about the materiality of wireless and other network systems. We are socialized to know so little about the infrastructures that surround us, even though many of us use mobile phones each day. Would our experience of mobile telephony change if we knew more about the architectures of signal distribution? It is difficult to say, but we certainly would have a different relation to the technology if we understood it as something more elaborate and expansive than something that rings in our purse or vibrates in our pocket. The emergence of wireless telephony has involved the sale and lease of public and private property, the allocation of space in the electromagnetic spectrum, the redefinition of urban, suburban and rural environments, and the alteration of patterns of daily life. By thinking around the antenna tree, perhaps it is possible to begin cultivating new critical approaches to the study of infrastructure and its relation to cultures of everyday life. Rarely do I ever think about how I am receiving any time of communication signal. Like you mention, people only seem to pay attention when something doesn’t work or it encroaches on personal space, but now I want to go around and try to spot all of these antenna trees. I’m curious as to how wildlife deals with this man-made structures that are trying to fit in with the “natural” environment. Thanks for the interesting columns and excellent pictures. What an interesting piece! I especially enjoyed its underlying ‘tongue-in-cheek’ tone. Several thoughts come to mind. First, if ever humankind arrives at an alternative technology to acomplish what these towers currently do, what will be done with these monstrosities? I wonder just how many ‘antenna trees’ we, as a nation, will have in the next 10 to 20 years. Next, one has to be somewhat grateful for the effort to disguise these things. And what of the effects of RF radiation on the surrounding wildlife? Congrats to you for a well written and very thought-provoking piece. Thanks, Lisa. Love the topic. Are there other examples of telecom infrastructure (v. architecture) that mimic natural forms? I’ve noticed that low-to-the-ground green plastic boxes and posts have been popping up in the front yards of houses in my neighborhood, courtesy of the cable company (Suddenlink). Maybe we cable customers should insist that these housings resemble the native cacti. It’s interesting how in the home, media have shed their wood grain cabinetry and colonial styling to become more hi-tech looking, while outside the trend is to wrap up towers in fake greenery. There must be something there to think about in terms of private and public taste, since municipalities can simply assume that a fake tree is preferable to bare metal. Also, I can only imagine the impact this trend will have on conspiracy theorists and the paranoid who already suspect potential control through the infrastructure. Hiding it (albeit in plain, tacky sight) will only fuel their anxieties that something is afoot. I have to say that I have never noticed antenna trees before. It makes sense that the only time that there is objection to cell towers is when they are aesthetically unpleasing. This makes me wonder how often an antenna tree can be found in poorer areas. They must be most commonly found in wealthy residential areas or popular national parks. Therefore, they are probably dominantly in areas visited by white middle- to upper-class peoples, seeing as how minorities have less wealth and less say in what is built in their backyards. Congrats on the wonderfully amazing article that you call Antenna Tree. I would like to hear your thoughts on what sorts of camo the wireless companies will think of next. Will it become harder and harder to identify our new infrastructure? Perhaps there are wireless towers that have been completely overlooked, like a sailboat bobbing in the harbor broadcasting through its large central appendage (the mast). Do you feel it is more ethical disguise our cell towers as man made object instead of poking fun at nature with our synthetic trees. Lisa Parks’ informative article, “Around the Antenna Tree: The Politics of Infrastructural Visibility” is an interesting yet overall disappointing examination of concealed infrastructure. The subject matter of the article is appealing enough for me to recommend it, and Parks does indeed have an engaging voice in her writing, but she had the material to make a potentially great paper and instead ended up with something only solidly good. It’s not a matter of high standards, a good paper is still a good paper, but when an article has the potential of greatness and misses, the reader feels more for the loss of a great paper than the gain of a good one. The Flaw in “Around the Antenna Tree” is that Parks hits on an issue involving infrastructural visibility and public passiveness, but instead of digging further into her subject and applying it to various infrastructures worldwide, she instead chooses to focus mainly on the infrastructural niche of cell towers. Parks details the history of cell towers being erected in various domestic areas around the U.S. including many residential communities and national parks. Understandably the public was quick to complain about the towers in their hometowns citing lowered housing costs and health risks as their reasoning. And despite the complaints of many visitors to national parks such as Yellowstone, the cellular companies owned the right to build their towers on federal lands, including the national parks. What’s more, the cellular companies provided the parks with annual land payments which economically was good compensation. 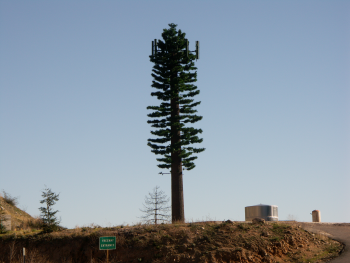 In response to these complaints many cell phone companies began disguising their towers so as to look reminiscent of trees according to their individual environments. These “antenna trees” as they were nicknamed, stopped the complaints in most metropolitan areas and it has since been increasingly adopted in other forms of infrastructure. Parks’ overview on cell towers is admittedly very fascinating and her article is particularly worthy of praise due to her conclusion of the ramifications of infrastructural visibility (or invisibility, to put it more accurately), but as stated before this important speculation of potential consequence is only mentioned in passing and thus a paper which could have gone on to pose some highly significant questions concludes pre-climatically. So the obligation falls on the reader to ask, “what can be said of the public if their opposition to infrastructure is based only on superficial reasoning?” The public, when in the face of physically unappealing infrastructure protested citing potentially hazardous environmental effect, energy and maintenance costs, etc. But simply by redesigning the infrastructure so as to make it more aesthetically pleasing, not by solving any of these problems, did the cellular companies prevail. What are the connotations of this? That the more companies hide their infrastructure (and thus means of operation) from us the less we will complain? Call me melodramatic, but this resonates to closely to brave new world/blind sheep metaphors for personal comfort. The public needs to be aware of what, and more importantly how infrastructure is being implemented for mass use. If we allow ourselves to passively go unquestioning of company development what then will happen when those companies develop environmentally harmful infrastructure, or inflate energy consumption and costs? What if we unwittingly become dependent on such harmful methods of production? These are the questions that barely scratch the surface of Parks’ article and it is for this reason alone that I both condone and condemn her article. It introduces the questions, but does not make them clear and instead relies on the reader to ask them. And ironically, if the readers are as passive as those individuals mentioned in the paper, then these questions will continue to go unasked. This article and the various community reactions to the issue of concealed telecommunications antennae mentioned within it, bring up an interesting issue involving environmental racism and consumer responsibility. Not in Our Back Yard groups are often started by members of affluent communities with enough free time and disposable income to plan meetings and stage events protesting what they see as a threat to their health, property values, and aesthetic pleasure. While these type of groups do good work for their communities, such as preventing the construction of known health risks like chemical plants, oil refineries, waste processing plants, and superfund sights, they also unwittingly force this type of development into low income areas whose residents do not have the resources to protest that kind of construction. While these sites pose a health risk to everyone in close proximity to them, their construction is often in response to some demand that comes from the greater area they service, a demand which stretches fairly evenly across various socioeconomic backgrounds. Subsequently, and unfortunately for low-income communities, decisions about the placement of these sights cannot be made simply by looking at who uses them. In the case of telecommunications towers, however, demand is rooted in a community’s use of telecommunications technologies, which are more widely available to those with larger wallets. Wireless companies would not be taking the time and money required to build cell towers if they did not stand to gain from their use, which is dependent upon their proximity to people with cell phones. Given that the health effects of cell towers are unknown, and thus cannot be designated as harmful or not, the issue regarding them is more, as stated in the column, about aesthetics. While it is understandable that people would not like the views from their front door step to be marred by a giant metal tower, growing use of cell phones and related products requires that kind of infrastructure be built. So if people want to use cell phones, they are going to have to put up with the things that help them to function. Since the people who use cell phones the most are those with disposable incomes they are the ones who will have to have cell towers installed in their communities. This is one example where “Not in My Backyard” groups are ineffective, so instead of banishing cell towers to low-income communities, community leaders simply choose to cover them up. While hiding cell towers within higher income communities is not much better than banishing them to low income communities, it does bring us one step closer to fair allocation of controversial infrastructure.